Attribution and authentication are like forensic science – tricky and exacting business. 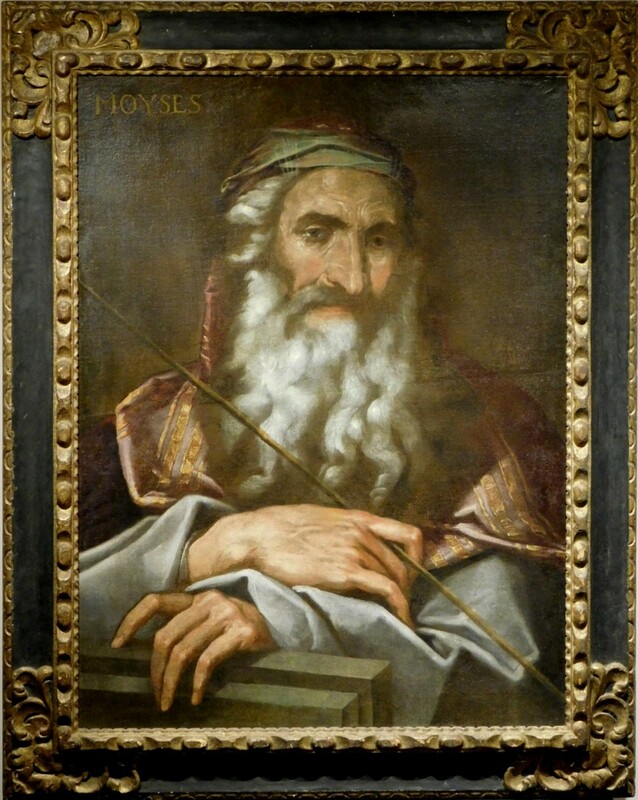 Take the oil painting shown here, an unsigned circa-1637 Portrait Study of Moses. In 1964, appraiser Sigmund Rothschild of New York concluded the portrait was “a lost work by Jose de Ribera (Sp., 1591-1652), from the Alcazar, which was destroyed by fire in 1734,” adding, “We know the Alcazar was a museum in Madrid destroyed by fire in 1734 that housed another Moses by Rivera,” but, more importantly, “the painting, under testing, shows evidence of fire.” Case solved! We tell this story now because this very painting is being offered at The Woodshed Gallery's next big auction, on Thursday, December 8th, online and at the firm's gallery in Franklin, Mass. The Discovery Auction will feature Old and New Masters, marine paintings, drawings attributed to Pop Artists such as Andy Warhol and Keith Haring, several good collections and, in the words of Woodshed Gallery owner Bruce Wood, “some under-appreciated artists.” The de Ribera portrait has an estimate of $30,000-$50,000. Visit www.woodshedgalleryauctions.com. As I write this, Manhattan and Brooklyn are competing in a Jewish court for the rights to claim the world's largest menorah. But let's consider for a moment the world's most expensive menorah. That question might be settled on or about December 12th, when the J. Greenstein & Company Auction House in Cedarhurst, N.Y., conducts an auction that will feature several menorahs expected to sell for $100,000 or more. 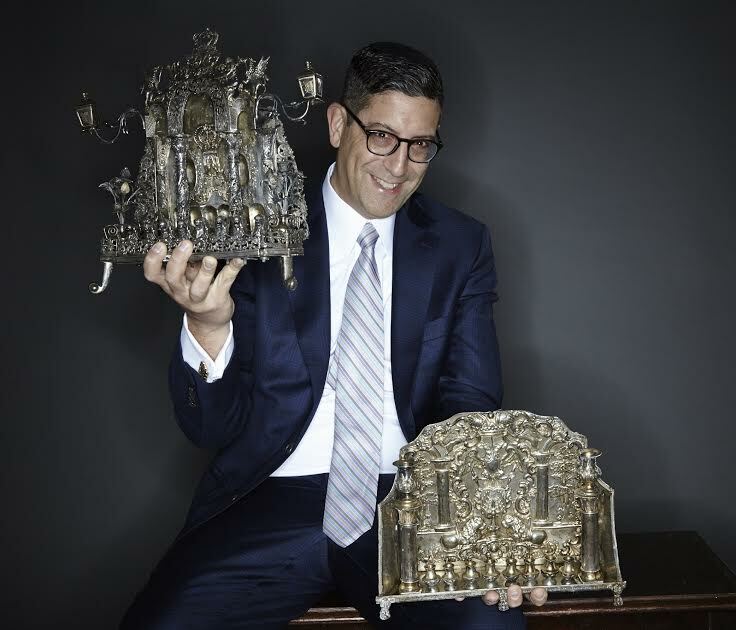 Two menorahs not in the auction, but for sale and on view during all of Chanukkah, are the ones shown here, with J. Greenstein & Co. president Jonathan Greenstein. The menorah pictured in Mr. Greenstein's left hand (the lower one), is from Kiev, Russia, made circa 1850. It's for sale, for a cool $250,000. The other menorah (high up) is from Altenberg, Germany, completed in 1860. It's known as a “hydra” menorah, as it's in the shape of an eight-headed hydra. It was formerly in the collection of financier Michael Steinhardt and carries a price tag of $100,000. Also in the auction will be antiques and collectibles representing streams of Judaism, such as a Torah from Persia and a lovely embroidered Sabbath hat from Poland. Visit www.jgreenstein.com. 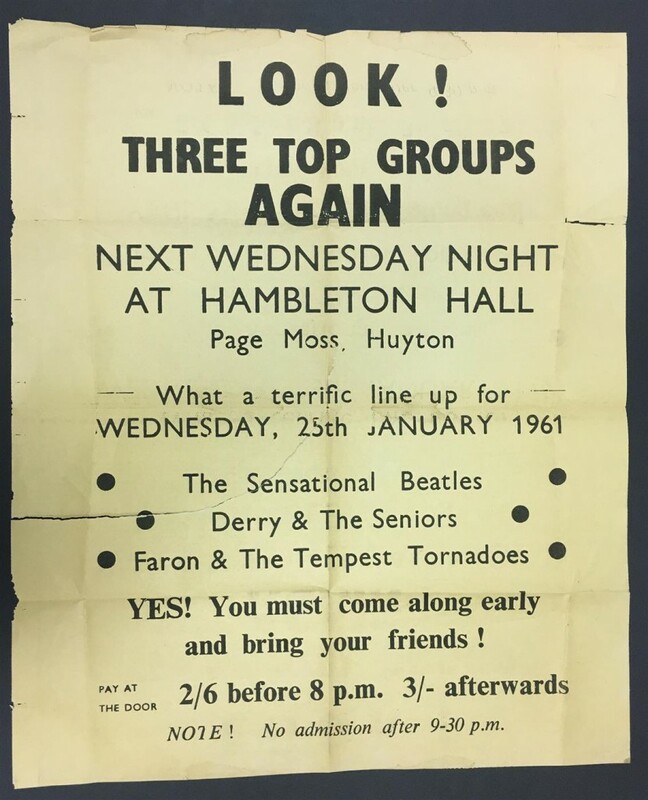 On January 25th, 1961, a pretty good skiffle band called the Beatles took the stage at Hambleton Hall in Huyton, England, feeling pretty good about themselves for getting top billing – as “The Sensational Beatles.” Little did they know the fame and the fortune that awaited them. It would be another three-plus years before they'd take America by storm, with an appearance on The Ed Sullivan Show, and go on to cement their place in history as the greatest rock 'n' roll band ever. Now, the poster for that 1961 concert in England is coming up for bid. It is one of the expected star lots in Weiss Auctions' two-day extravaganza, planned for Dec. 17-18, online and in Lynbrook, N.Y. In addition to the exceedingly rare Beatles poster, other rock memorabilia will include a Janis Joplin poster, from the singer's 1968 appearance at the Aerodome venue in New York; a Rolling Stones Let it Bleed color variant pressing, Bill Graham Fillmore posters, posters for Ray Charles and the Grateful Dead, and more. The sale will feature hundreds of items in many collecting categories. Visit www.weissauctions.com. I was at the home of a wealthy friend one time in New Canaan, Connecticut, and noticed he had a Norman Rockwell painting hanging on his wall that looked like an original. I asked him about it and he said, “Oh, yes, it's real. And see that little boy? That was me. I'm in the painting.” And that's what you call impeccable provenance. A similar situation has presented itself in Kansas City, Mo., where an original, never-before offered painting by Thomas Hart Benton (Am., 1889-1975), shown here, will be sold in KC Auction & Appraisal's online-only auction ending Dec. 12. The young man depicted in the foreground is Randall Jessee, who happens to be the consignor. The Jessees were neighbors of the Bentons for a few years and the painting was done during that time (circa 1967-1968). 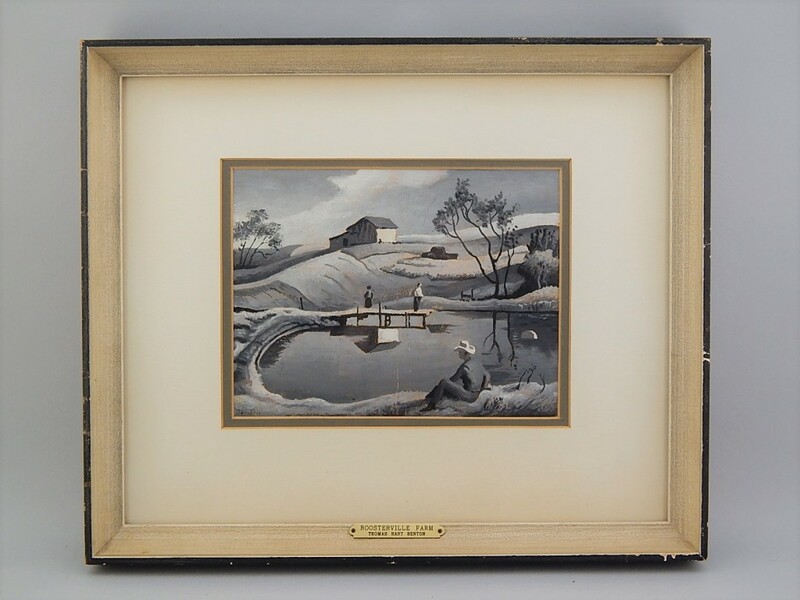 The diminutive work – 8 ½ inches by 6 ½ inches, less the frame – was signed by Benton lower left. There's a Maryland frame shop label on the reverse, because the Jessees moved to Maryland shortly afterward. The woman on the dock is Rita Benton, Thomas's wife. The truck near the barn was Randall's at the time. Visit www.kcauctioncompany.com. 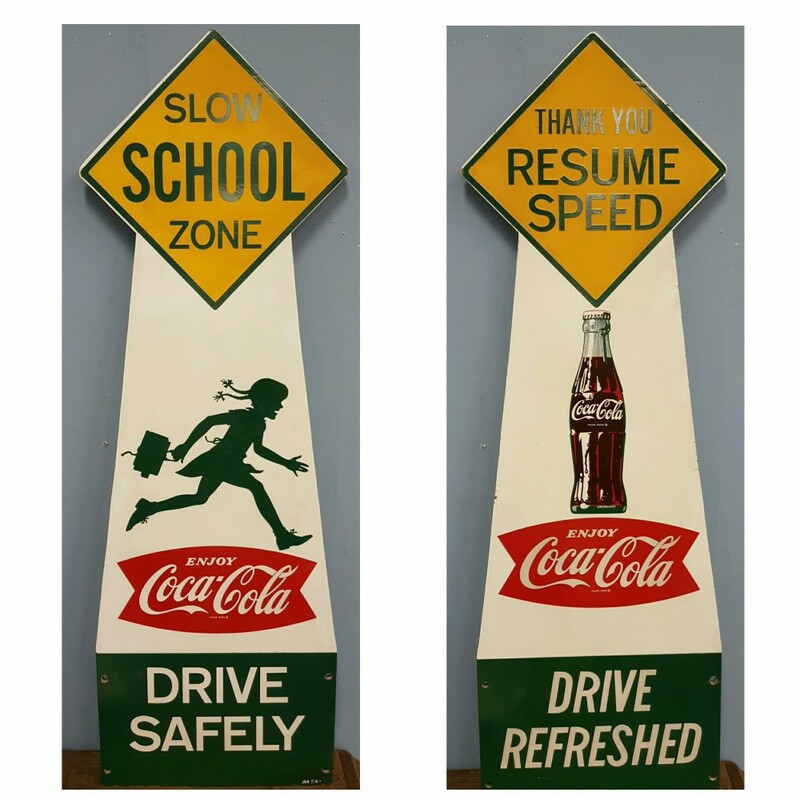 Coca-Cola collectibles are hugely popular no matter what the item, but this one caught our eye because it doubles as a school crossing sign and is in pristine condition for its age (made in 1954). The 16 inch by 48 inch NOS (new old stock) double-sided wooden sign with a diamond-shaped top is a featured lot at Rockabilly Auctions' big New Year's Eve sale planned for December 31st, online and in Commerce, Ga. It comes with a letter of authenticity from Biscoe Coca-Cola Bottling Company (Biscoe, N.C.). The firm operated from 1909 to 1990. Rockabilly's year-end auction of mostly advertising, Americana and nostalgia is typically one of their biggest events of the year. This year's catalog will feature many rare and unusual items, to include petroliana (oil and gas collectibles), advertising signs, clocks and thermometers, barber shop, gas station, general store, toys, coins, comics, soda fountain, military, coin-op, railroad, vending machines and more. The sale will get underway promptly at 10 am Eastern time. The Coke sign has an estimate of $1,500-$5,000. Visit www.rockabillyauction.com.